LET THE WILD RUMPUS BEGIN!! - The classic children's book by Maurice Sendak has been turned into an admirable feature film by Spike Jonze. When someone takes a children’s book and turns it into a Jim Carrey movie (see Grinch) or a 3D animated nightmare (Meatballs, which wasn’t even a great book), yer doomed. Doomed to go to the cinema and plunk yer money down and emerge disgusted (Grinch) or nonplussed (Meatballs). 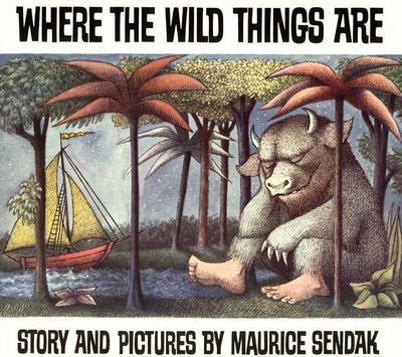 When you are taking on a real genuine classic such as the ethereal book by Maurice Sendak, you are playing with fire, brother. It is a wonder that even the talented Spike Jonze could emerge with anything that remotely did justice. Jones has scored here in a big way. The book has been done an indelible honor. The story, for the unwashed, is about Max, a boy whose mother sends him to bed without his supper. As Max’s temper burns the way only a little kid’s temper can burn, he escapes to his room, journeying to an island of monsters where Max becomes king. The film, which goes where a child’s unfettered imagination and beast-like instincts tend to go, plays like a crazy dream. It doesn’t always make sense, like a kid’s story might not make sense, but it goes there no questions asked. Like your own dreams, you just accept the proceedings, at least until you wake up. This is Max’s internal world, made live for you to tread. The famed Sendak monsters are probably the greatest ever conceived in children’s literature and their representation here is right. Further, their monster-ness is right. Their vocalizations are correct. Their overall effect taps into the same deep pool of feeling that somehow turns a moth eaten sock into a Muppet. They reflect accurately a child’s world. And this child’s world is no garden of eden. It is full of thunderheads of love, fear, anger, hate, mischief, sadness and joy. Having a film capture such a complicated landscape in such a simple way is an utter surprise in today’s cinema. It is a film I can’t wait to see again. 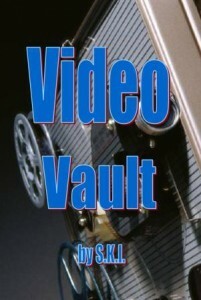 You, dear Vaultkateers, ought to check it out before its out of theaters. It is probably in second runs now and you might want to take the time. For me, it kind of took me back to busy summer days long forgotten. It refreshed in me a way of looking at the world that is indescribably delicious, simple and beautiful. 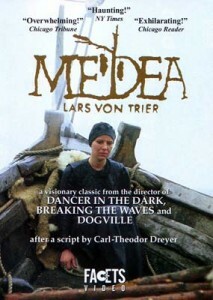 THE ORIGINAL REVENGE STORY – “Medea” was shot as a made for TV film in 1987 by Danish auteur Lars von Trier. It is the original revenge story, I suppose. Based on a script by Carl Theodore Dreyer, director Lars Von Trier’s dark vision of the Greek tragedy takes place in the marshes of Denmark where the jilted Medea (Kirsten Olesen) has vowed to exact vengeance upon Jaosn (Udo Kier). “Medea” is a 1987 made for TV project that does a lot of experimenting with the visual. My technical expertise is thin enough that I can’t rightly explain how some of the eerie and evocative images were made. It appears to have been shot in layers, with saturated colors that lend a hazy look to the proceedings, as if you’re watching the film through gauze. Yet there are some amazingly evocative pictures. The way images bleed together, they look like old VCR tape that’s been worn through to breaking. The superimposition of some images looks at times like a bad attempt at 3D, with one flat background playing like a live matte painting as backdrop to the action. Viewers who have the temerity to find this obscure film might not have the strength to wade through all the uncomfortable imagery to its haunting resolution. And that’s all before we get to our disturbing title character. Medea is obviously wise and probably is some sort of witch or “dark artist.” She’s given credit for helping the hero, Jason, solve the riddle of the oracle. But when Jason parlays his exploits into the hand of the king’s daughter, our Medea sets out on the original path of revenge. Look. It’s Greek tragedy. And there have been many revenge stories on down the years since 400 B.C. but few that land as savagely as this. DARK WORLD - A man and a boy walk south along The Road. Still in theaters if you hurry, the dark apocalyptic vision of Cormac McCarthey was filmed on locations in Pennsylvania, Oregon and at Mount Saint Helens. Just another note before we go. I mentioned to you a film almost two years ago that I was looking forward to like few other. I thought it had the chance to be a best picture type film and am happy to report that I still feel that way. “The Road” is still out there in theaters, but few have heard anything about it. It is drawn from perhaps the most terrifying novel I’ve ever read, by Cormac McCarthey, of the same title and director John Hillcoat has perfectly captured the spirit of the book in one hell of a dark vision. The story is of a post-apocalyptic world where a “Man” and a “Boy” are walking south along a road. Around them, human society has collapsed. It is cold and ash covers the earth. There is no vegetation and towns have been picked clean. All that remains are scavengers. The story strips the human condition down to its bare basics. It is grim, to be sure, but in a way that I think ultimately lifts up human dignity. I cannot recommend the film strongly enough. But be warned: It is no walk in the park. Catch it, if you still can, while its still in theaters.